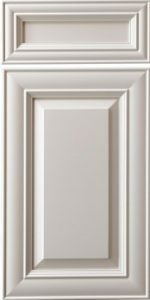 Working perfectly with most any décor & a great gather of glazes, the CRP-10875 is one of our most popular doors (besides the simple raised panel CRP-10 & shaker doors). Please note this door is NOT AVAILABLE FOR INSET CABINETS. To optimize this door for painted finishes, Conestoga (CWS) designed the CRP-10875 (MDF), which touts five-piece, full MDF construction, & mitered joints. If you love the design of the CRP-10875 but want a painted finish, then consider this MDF model.